Albert Jordan was a member of the St Paul’s Literary and Educational Society which published a selection of essays and reports by members each year. The bound copies were then loaned out to members of the Society. We have copies of ‘Odds and Ends’, as it was known, for 1917 and 1918, and included in amongst the poetry and watercolour illustrations are some fascinating insights into life on the home front. Albert Jordan wrote a long and detailed account of his work as an enlistment clerk. For any historian researching these practical processes it could be a valuable resource. Here are some extracts from that account. It may be that in the years to come some casual reader of this magazine, browsing around these pages, will have his attention arrested by the above heading and pausing to reflect, may remember that, though he may have heard and read much of the marvellous doing of those sons of England, during the great war, and may have even himself have taken part in the fighting with all its misery and glory; he still has little or no knowledge of how that tremendous force came into being as a fighting force; and it is with a view to giving him some slight insight of that work, that these few pages are written. The reader, of course, already knows how in the first few months of war, the wild enthusiasm of hundreds of thousands caused them to fling away their business positions in office, workshop, mine, or wherever it might be in order to join the ranks, and how rich and poor, educated and illiterate, virtuous and vicious, stood shoulder to shoulder learning their drill, and enduring all the discomforts and dangers of camp life, with very inadequate equipment, shelter and food. But in spite of the immense numbers who had already joined, it had become, by the spring of 1915, quite evident that only the united and entire effort of the whole nation, could avail against the danger that threatened us. A great and powerful nation, long prepared for war with millions of men fully equipped, already in the field, and with tremendous resources of her own and her allies to fall back upon, could not be overcome except by the most strenuous effort on the part of those opposed to her. Accordingly as an early part of her preparation, the Government of this country, decided that on August 16th 1915, a census should be taken of the whole of the population between the ages of 16 and 62. This having been done, the papers were taken charge of, in the first instance, by the Local Authorities, and in Manchester, the clerical staff at the town hall were sent to work, extracting from the returns, each on a separate form, the particulars of each male between the ages of 18 and 40 years. These were in turn passed on to the Military Authorities, who presently issued an appeal for voluntary assistance in the clerical work necessary. Such an appeal had only to be issued to meet with an immediate and hearty response; and amongst many others, the present writer expressed his desire and willingness to do what he could. Long past the military age, and never at any time a fighting man, I nevertheless desired to do what little I could. I think and hope that, had I been within the military age, and found physically fit, I should have been found brave enough, even though fearful to offer myself to my country’s need. But this could not be, and it was with feelings of great satisfaction that I received a notice to attend at the Hulme Town Hall at the request of the military authorities. Armed with my notice, I duly presented myself and was taken into the large hall, capable of holding some hundreds of people. The floor space was taken up with plank tables, and forms for seats. Inkwells, blotting paper and pens were scattered over the tables, and already a number of persons were at work under the supervision of a small permanent staff previously engaged. I was placed at one of the tables and given a packet of ten of the papers I have already alluded to as containing the particulars of all men of military age. The information given included the man’s full name, and address, year of birth, age, married or single, children over sixteen years of age, people wholly or partly dependant on him, occupation, employers’ name, business and place of business, also number of area, number of polling district, and occupation number, altogether a well thought out scheme giving all the necessary information. With these ten papers we were also given ten white cards, ten coloured cards and an army form divided into ten places, with the instruction to copy all the particulars from the originals onto the two cards and army form. Although almost entirely routine work, this was not at all uninteresting, the difficulty in at times deciphering the writing with the possibility of making errors that might easily lead to later confusion and the unintended humour sometimes to be found all varied the monotony. In one case I found that a comparatively young man claimed as having dependant on him, eight children over sixteen, seven under sixteen, and eight other persons partially dependant upon him, making one think that he must have totalled up the whole of his relations and put them down. In another case the man apparently desirous of showing that someone found him useful, put down his landlady as dependant upon him. Such as these added a little variety to the work. He mentions restricted trades and ‘starred’ men. Having got all the particulars of all the men; the next step necessary was to get the men themselves. All could not be taken, some were necessary to make supplies for the army; others could not be taken from certain occupations if the trade of the country was not to be entirely stopped. To avoid taking these men, certain trades were made restricted, and the workers became known as starred men, and their cards and army forms marked accordingly, showing that they were not to be touched. Lord Derby had been appointed by the government as Director of Recruiting with the idea of getting a voluntary army without having recourse to conscription. The political parties were asked to undertake the personal canvas of men already not in the army. One set of the cards we had made was issued for their use, and we waited for the returns . Presently these commenced to come in, and although considerable success had been attained it was very evident that the bulk of the willing fighters had already gone and many of the cards contained excuses, some pitiful, some curious, and some frankly indifferent or hostile. I think the most humorous part of our work consisted in reading the various remarks on the cards, when entering them up as we had to do on the army forms. It soon could be seen that unless greater numbers came in, conscription would be unavoidable, and presently a date was fixed when voluntary enlistment would be closed. This started things off with a rush, and such scenes were witnessed as had never before been seen. It was also made known that all who enlisted could not be taken into service at once, as arms and equipment were not ready for them, but they would be entitled to wear Khaki Armlets which would be issued on a certain day, and the wearing of which would proclaim to their fellows that they had voluntarily offered themselves for service. 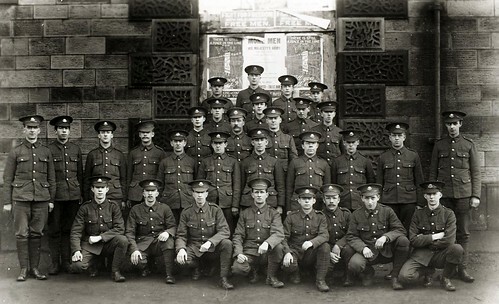 The existing recruiting stations soon became all insufficient and others were opened at various Public Halls, and amongst them at the Hulme Town Hall. There still remained of course an immense number of men who had not been enlisted, and further efforts, finally resulting in conscription were made, but the remaining work so far as our labours were concerned was of such a character and proportion that it could be readily dealt with by the permanent staff, and so by the time that February 1916 came around, I and most other of my fellow voluntary workers felt that we could withdraw with the happy consciousness that we had been at any rate of some little use in ‘Gathering the Army’.